Derek Martinus, who has died aged 82, was an extraordinarily versatile theatre and television director and occasional actor who enjoyed the kind of varied artistic career hard to imagine today. As a contracted BBC TV director, he was responsible for many early episodes of Doctor Who, in which he worked with William Hartnell, Patrick Troughton and Jon Pertwee. As a theatre director, he ran the pioneering in-the-round Pembroke theatre in Croydon (1959-62), helping, along with Stephen Joseph in Scarborough, to put a new configuration on the map. In what was a golden age for TV drama, when directors were expected to turn a hand to everything, Derek worked on long-running popular series such as Z Cars and Angels, and directed classic serials such as Dumas’s The Black Tulip (1970), starring Simon Ward, and Sybille Bedford’s A Legacy (1975), with Claire Bloom and Jeremy Brett. And there were straight plays including Strindberg’s The Stronger and Maggie Wadey’s In the Labyrinth, the latter starring a young Michael Gambon. Derek later moved to ITV, where he twice won the Pye award for best children’s drama, first with The Paper Lads, then with Dodger, Bonzo and the Rest. In the late 1970s Derek returned to theatre both in Britain and Sweden, where he and his wife had a summer home. He introduced Harold Pinter’s The Homecoming and Caryl Churchill’s Mad Forest to Swedish audiences as well as doing classic plays by Shakespeare, Jonson and Dekker. Back home he directed a West End thriller, The Killing Game (1981), with Hannah Gordon and Peter Gilmore, for Bill Kenwright, and did much excellent work at the Guildhall School, London: I remember a rousing production of a scandalously neglected early Ibsen play, League of Youth, in which the lead role was taken by an intemperately exciting young actor called Damian Lewis. I first met Derek in 1963 at the Theatre Royal, Lincoln, where he was working as a freelance director. I knew about his adventurous seasons in Croydon, where he had directed some 20 plays including Jean Anouilh’s Thieves’ Carnival and Russell Braddon’s The Naked Island. I also have a vivid memory of gathering with friends round a TV set one Sunday night to watch a Philip Saville production of a new Charles Wood play. It was not hard to tell from Derek’s close analysis of the camerawork that he was destined for television, and it came as no surprise to learn that in 1965 he had signed up for the BBC directors course. He was to stay under contract for seven years. Derek was born in Ilford, Essex, to Jack Butenhuis, a meat wholesaler at Smithfield market, and his wife, Irene. For stage purposes, Derek drew on the name of his grandfather, Johan Martinus Buitenhuis, a meat trader from Rotterdam. The family lived in Gidea Park, and Derek studied at Brentwood school. As a young man he joined an amateur group, the Taverners, as did Timothy West. It toured Shakespeare plays round London pubs, as it had done throughout the second world war. After national service in the RAF, Derek studied directing and acting at the University of Oklahoma and Yale school of drama, and by the mid-50s was back in Britain, working as a jobbing actor in regional rep. In 1959 he went on a study tour of Scandinavian theatre on which he met his future wife, Eivor, who was to become a noted translator and biographer of Strindberg. Derek was a passionate cricket-lover, a member of the Stage Cricket Club and an artistic all-rounder. Equally at home in theatre or television, in Britain or Sweden, he was a crosscultural figure who never seemed to stop working and who brought the same eager commitment to little-known Scandinavian drama as to Doctor Who. He is survived by Eivor, two daughters, Charlotta and Pia, two grandsons and a granddaughter. 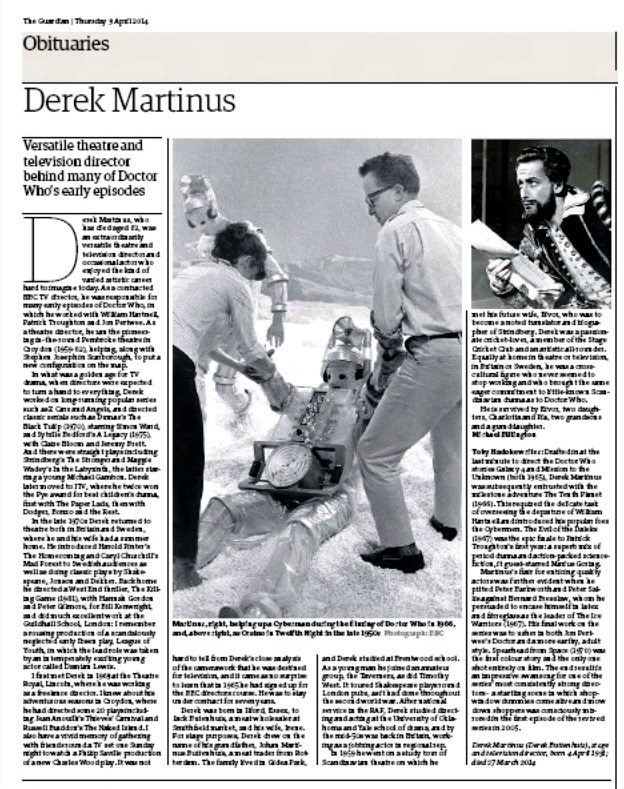 Toby Hadoke writes: Drafted in at the last minute to direct the Doctor Who stories Galaxy 4 and Mission to the Unknown (both 1965), Derek Martinus was subsequently entrusted with the milestone adventure The Tenth Planet (1966). This required the delicate task of overseeing the departure of William Hartnell and introduced his popular foes the Cybermen. The Evil of the Daleks (1967) was the epic finale to Patrick Troughton’s first year: a superb mix of period drama and action-packed science fiction, it guest-starred Marius Goring. APA 6th ed. : Hadoke, Michael Billington, Toby (2014-04-03). Derek Martinus obituary. The Guardian p. 37. MLA 7th ed. : Hadoke, Michael Billington, Toby. "Derek Martinus obituary." The Guardian [add city] 2014-04-03, 37. Print. Turabian: Hadoke, Michael Billington, Toby. "Derek Martinus obituary." The Guardian, 2014-04-03, section, 37 edition. This page was last modified on 9 July 2014, at 22:50.